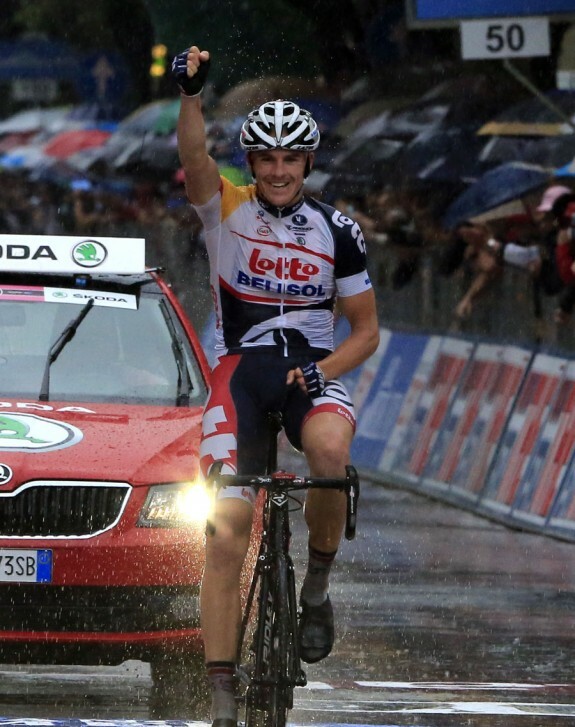 Part 2 of What Have We Learned at the 2013 Giro? Official race moto sent ahead to warn riders of a very tight right hand bend comes to grief just in front of the peloton, thankfully moto riders were ok and riders weren’t affected. Australian hardman and key domestique (team worker) for Lotto Belisol, Adam Hansen wins the stage after a 150km breakaway. In 2012, Hansen became a member of the exclusive club of riders who have completed all three Grand Tours (Italy, France and Spain) in the same year. Wearing his national champion’s skinsuit, Essex boy Alex Dowsett storms to the stage win. Yes, there was a British winner of the individual 54.8km time trial but it wasn’t who was expected. National Time Trail champion Alex Dowsett (Movistar) did an amazing ride to win his first Grand Tour stage win, in his first Grand Tour, to beat pre-race favourite Sir Bradley Wiggins by 10 seconds. Columbian Carlos Betancur ‘celebrates’ as he crosses the line at the end of the stage after making it up to the day’s breakaway riders and going past them to take the sprint finish. 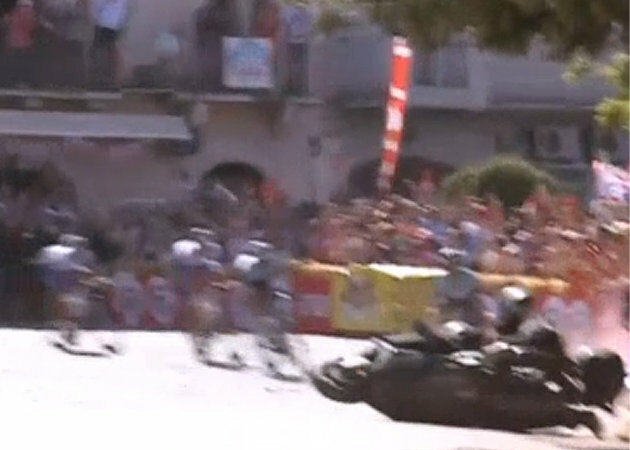 Unfortunately for Betancur, Russian Maxim Belkov had already crossed the line in first place 44 seconds earlier. Rest days in Grand Tours may mean a break in racing for the riders and a chance to catch up with everyday tasks and many riders will do several hours riding on these days to keep the legs turning. Important riders in the race also give press conferences; think some may find the racing less stressful. Never mind the riders complaining of crashing on the descents, anyone watching the Eurosport coverage of the race today must be wondering what happened to this unlucky spectator on the climb. He moved back as the riders passed but unfortunately there was no ground behind him. Certainly cheered up the guy beside him holding the camera so he must have been ok. 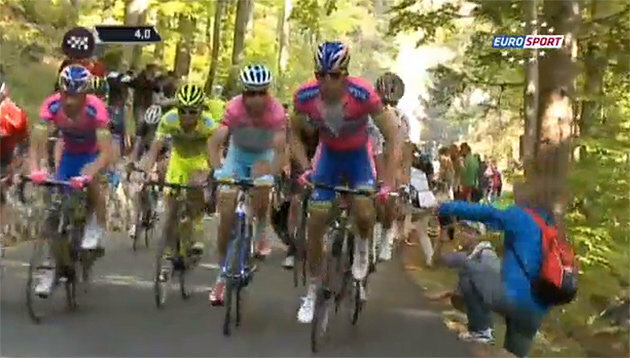 Tagged giro, giro d'italia, pro, pro cycling, pro racing. Bookmark the permalink.